The urbanization of North Carolina, especially the Piedmont region, is undeniable. Forests and fields are being replaced rapidly by strip malls and suburbs. Those of us who appreciate native ecosystems have been noticing their decline for some time. Invasive non-native species are increasingly prevalent, and native flora and fauna are being displaced at alarming rates. 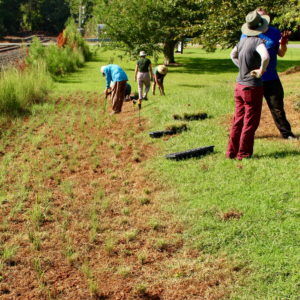 In collaboration with several like-minded organizations, the parishioners of the Episcopal Church of the Advocate in Chapel Hill decided to create a safe haven and food source for displaced wildlife by planting as many well-adapted native plant species as possible on part of their fifteen-acre property that includes an old one-acre farm pond. To begin the work, they applied for and won a Stewardship of Creation grant from The Episcopal Church in November 2017. 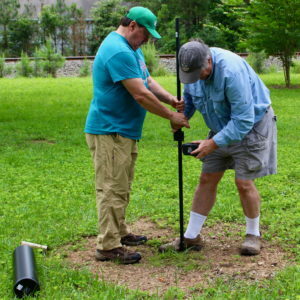 Funds from the three-year grant are mostly allocated for educational outreach activities that include a Web site (www.piedmontpatch.org), a Facebook page, and the sponsorship of free quarterly lectures open to the public on relevant topics. A growing list of partner organizations and like-minded individuals continue to strengthen ongoing work at the Piedmont Patch demonstration site. 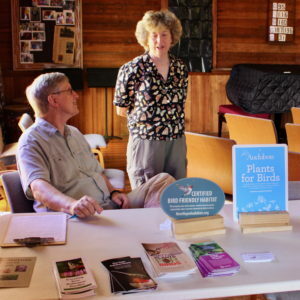 The New Hope Audubon Society has been a key partner from the time of the first free lecture last winter, when Barbara Driscoll staffed a table to provide information on the bird-friendly communities program. On June 5, the New Hope Audubon Society donated 10 bird boxes (5 Eastern Bluebird and 5 Brown-headed Nuthatch), which were installed by Tom Driscoll and Vern Bothwell. Two weeks after the boxes were installed, bluebirds hatched their first brood in one of the boxes, amply demonstrating the need for native habitat and nesting sites for birds and other wildlife in our rapidly urbanizing area. The Piedmont Patch quarterly series of free lectures has been well-received by the community. 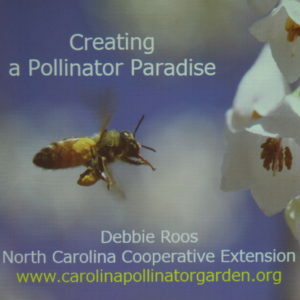 The first lecture on February 17 featured Debbie Roos, an agricultural extension agent in Chatham county who is known throughout the region for her expertise on pollinators and pollinator gardens. The second lecture on May 19 featured Amy Brightwood, a horticultural therapist, who spoke on the therapeutic value of working with plants. The third lecture on September 22 featured Barbara and Tom Driscoll, who talked about the benefits of planting bird-friendly natives and demonstrated how to maintain bird boxes using the ones installed on the Piedmont Patch demonstration site. A presentation on invasive non-native plants and their eradication methods is planned for the fourth-quarter lecture. 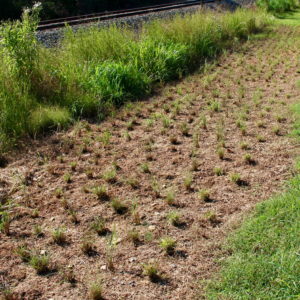 A small portion of the grant from the Episcopal Church was allocated for the acquisition of plants; most of those funds were spent on over 700 plugs of four species of native grasses – Little Bluestem (Schizachyrium scoparium), Indian Grass (Sorghastrum nutans), Purple Love Grass (Eragrostis spectabilis), and Big Bluestem (Andropogon gerardii) – and about one hundred tough native wildflowers representing 8 species – Aromatic Aster (Symphyotrichum oblongifolium), Rough-leaved Goldenrod (Solidago rugosa), Star Tickseed (Coreopsis pubescens), Common Milkweed (Asclepias syriaca), Wild Quinine (Parthenium integrifolium), Mountain Mint (Pycnanthemum muticum), Eastern Columbine (Aquilegia canadensis), and Annual Blanket Flower (Gaillardia pulchella). These were planted on the steep side of the earthen dam on one side of the pond. On April 14, 40 volunteers planted everything in around two hours. Since then, additional species have been added, thanks to generous donations from Cure Nursery, the North Carolina Botanical Garden, and Plant Delights Nursery. Thanks in part to abundant rains, all the new plants are growing well. To protect the integrity of the earthen dam, plantings are intended to be limited to herbaceous plants only. An annual late-winter burn of the dam should suppress encroachment of woody species. In August, Hoffman Nursery donated to Piedmont Patch about 1000 surplus plugs of several native species of grasses and sedges. About a dozen volunteers assembled on September 8 to plant this unexpected bonanza in a new area in front of the church. The rains of Hurricane Florence have ensured their transplanting success. All Piedmont gardeners know that autumn is the best season for transplanting trees and shrubs, because soil temperatures remain warm enough for plants to grow healthy root systems while leaf growth stops during winter months. Thus, Piedmont Patch will host its Fall Planting Day on Saturday, October 20 from 9:00 AM to noon. The last of the Episcopal Church grant funds allotted for plants have been generously supplemented by a donation from the New Hope Audubon Society; most of these funds will pay for the acquisition of native shrubs and small trees known to be excellent food and cover for birds and other wildlife. Volunteers of all skill levels and abilities are needed for this last big planting effort. If you’re interested in helping on October 20, please email your intentions to piedmontpatch@gmail.com. The goal of the Piedmont Patch is to serve as an example of how urban and suburban landscapes can become havens for displaced wildlife by incorporating native plants in their designs, restoring native habitat one patch of Piedmont at a time. The grounds of the Church of the Advocate are open to the public. All are invited to stop by, survey the Piedmont Patch plantings, and, we hope, be inspired to add a Piedmont patch to their own private or public landscape. Catherine Bollinger is a freelance writer and editor possessing a lifelong obsession with the native flora and fauna of the southeastern US. On her blog (piedmontgardener.com) and Facebook page, she is known as Piedmont Gardener.